It took over a couple of years to even begin to come to terms with the results of the filming that I had conducted during those three terrifying months of 2008. I had made the difficult decision to end the filming due to the horrendous demonic attacks and also on the advice of fellow Christians. It was a hard decision to stop the filming at the time because I didn’t know how to proceed after I destroyed the footage. I believe that I was suffering from Post Traumatic Stress Disorder (PTSD) because of the terror that I had personally witnessed for that period of time. The world as I had previously known it was basically turned upside down. Despite all of the constant attacks, I knew it was an absolute blessing because I received the Lord Jesus Christ as my Savior. It was through these very experiences that God showed me that the Jesus of the Bible is not just some historical figure but truly the living God (Holy Trinity) and Savior to all who trust in Him. I give all the glory to Jesus because He is the only way I made it through the very real spiritual war. These events caused my perspective to radically change. Suddenly certain aspects of my life that were so important before seemed so small and irrelevant. I had a very difficult time concentrating at work. Work just simply wasn’t as important anymore. I couldn’t focus and I was barely able to function. I was a mess just trying to keep it together. Furthermore, it certainly didn’t help that all during this time I was still being harassed by the demonic on a daily basis. The crows were still showing up frequently to play with my nerves and intimidate. Demonic faces still appeared on my computer screen and television screen. Even though I wasn’t watching anything paranormal any longer – these evil spirits would still show up clearly in unrelated photos and footage. In addition, this wasn’t just once or twice that I would see these evil faces – this was on a daily basis; almost every time turned on the computer. Before this all started in 2008 I couldn’t see them at all – now it seemed that I couldn’t stop seeing them even though I didn’t want to any longer. In the videos and photographs I would watch – these demons still looked the same as when I had filmed them. The vast majority of the demons still looked like what the world describes as “grey aliens”. Of course, the whole “alien” satanic lie is from the pit of hell – these evil spirits are absolutely demons without any doubt whatsoever. When these demons would appear in a video or photo, it would be very rare that I would just see one. Often there could be half a dozen, or sometimes dozens upon dozens in the same screen shot. Sometimes there were so many that their heads were overlapping – there were so many that their heads would appear stuck together. It’s important to mention that these demonic spirits were not like the wind where I would be guessing where they were; not at all. The faces of these demons were clear and distinct and I could point to exactly where they were located in the footage or photo. I could see their large almond-shaped eyes and the distinctive head. Sometimes there would be some faces mixed in there that looked different from the rest. One night I saw what I can only describe as an “old hag” that I believe was mentioned in earlier ages. There were some ghostly terrifying faces. Their goal with the constant harassment was to basically drive me insane and destroy my life in one way or another. By the way, the truth is that there are NO ghosts. Not only are there no so-called “aliens” – there are no so-called “ghosts” either. I’m sorry to spoil all the ‘fun’ but “ghosts” and “aliens” are one of the same – both are the exact same lying and deceiving demons. The actual content of the video or photo didn’t seem to matter when the demonic faces would appear. As mentioned previously, I’m an Elvis fan and I’ve seen many demons show up in footage or photos with him. I saw some footage where Elvis was in the backstage dressing room and they appeared everywhere – I could see demonic faces in Elvis’ hair, on the coats of other people in the room etc. I saw a picture of John Lennon and Yoko Ono walking and there were about three demons that appeared clearly in that photo. It sounds very bizarre because we are dealing with evil spirits that defy logic, but there was a huge “grey head” coming out of John’s left side- large eyes; same classic shape. They don’t just appear in celebrity media. I’ve seen them in regular videos as well. I recall one video that I watched where a young woman was playing guitar on her bed facing the video camera. In the background I could see many evil faces, so many they were overlapping, looking down at her. This was right in her bedroom and the faces were located in the corners of the wall where the wall meets the ceiling. There were so many, and they were so clear to see, I was actually concerned and tried to contact her to see if she was suffering from demonic harassment. Unfortunately she never responded. I still continue to see demonic faces in videos and photographs to this day. What I still find hard to determine is whether the demons were actually in the photo at the time or are they just appearing on my screen now. I’ve come to the conclusion that it’s really a bit of both. Sometimes they were there at the time, sometimes they’re appearing to specifically harass me. I’m so used to seeing these unclean spirits that I try to ignore seeing them for the most part when I can. Unfortunately, I can’t completely stop seeing them now unless I stop watching television and stop using my computer. A few major events occurred after I decided to stop the filming. Just to mention one thing as an FYI, I didn’t end the filming because they stopped appearing. They were still there whenever I wanted to film them. In fact, I could still film them today. However, a true believer in Jesus Christ filming demons just doesn’t mix as most reasonable people would agree. I think even unbelievers could understand that they don’t go together. 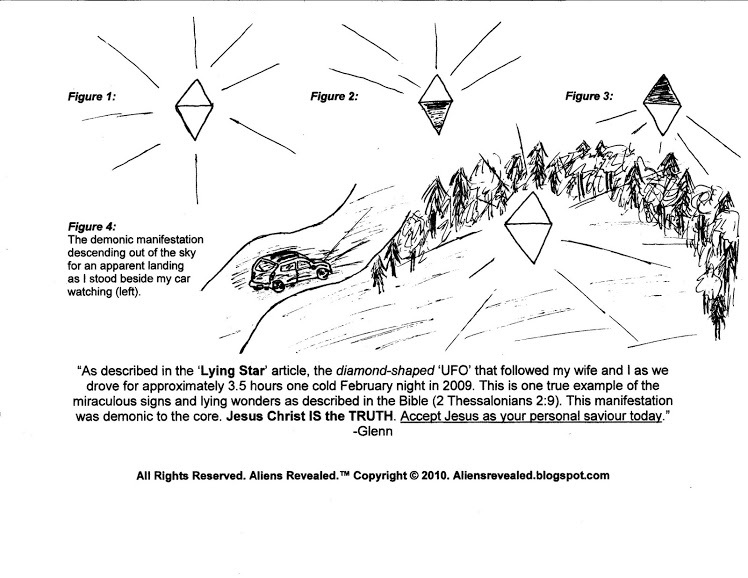 In early 2009, I received the rapture message from God, “The alien/Ufo phenomenon will be used to explain the rapture to non-believers.” Approximately a month or so after receiving the rapture message, my wife and I were followed by a diamond-shaped ufo for almost four hours (as described in the Lying Star article/sketches at bottom of blog). This UFO was not some “alien” spacecraft as these evil spirits would have liked us to believe – it was in fact a demonic manifestation. A very real manifestation that I’m sure other drivers on the road could see as well. Speaking of ‘real’, it has shocked me from the very beginning how real all of this truly is. There is a real war going on behind the scenes for souls. Around that time I also agreed to appear on an internet radio program to tell my true story. The very night that I had agreed to appear on the program, I was awoken by a demon. It was saying in an audible voice, “I am your friend.” I recalled hearing it while I was sleeping and then I heard its raspy voice one last time while I was actually awake. I did not see it in my room praise the Lord. I most certainly heard it though, and its message shows the depravity of the lengths they will go to deceive. I was finally able to command it to go in the name of Jesus Christ. It left instantly once I said Jesus’ name. INSTANTLY. On another night I found myself in a terrifying situation of being pulled out of my body. Somehow these evil beings were able to pull me out of my body and I was going upwards at an extremely fast rate of speed. I’ve since heard people doubting if Jesus’ name actually works- some people think only Yeshua works. Well, I can’t think of a more dire time to prove that Jesus’ name really works than being pulled out of your body and going who knows where at a unbelievably fast rate of speed. Unfortunately, the first two times I called out to my wife because that was the last ‘earthy’ location I would remember – lying next to her in bed. Once screaming her name in absolute terror didn’t work (I was screaming in the spirit, not physically which is why she couldn’t hear me) – I said, “Jesus!” Instantly, and I mean instantly – I was back in my body, awake next to my wife. On yet another night I was sleeping and then suddenly awoken by a demonic attack that hit me in the stomach (abdominal) region. The force of the attack was so strong it instantly woke me up. Simultaneously, my wife started speaking in some unfamiliar foreign language that I guessed to be Latin or Greek. As if this wasn’t bad enough, I was being choked and I was having a very difficult time calling on Jesus. I could only get out, “In the name of…” “In the name of…” Although I’m sure it seemed like this incident was longer in time, in reality the whole event was only mere seconds. I was finally able to say, “Jesus!” and instantly-again, INSTANTLY- it was over. My wife stopped talking in a foreign language and I stopped being choked. They were gone and a believer using Jesus’ name with authority over demons was proven once again. As time passed, the attacks diminished in strength but have never gone completely away. One consequence that I’ve suffered as a direct result of filming the demons was demonic possession. This is a controversial subject among Christians: Can a Christian be possessed? I’m convinced that the answer is YES. Christians, true saved believers in Jesus Christ, have a body, soul, and spirit. Although I wrestled with this question, over time I have become quite certain that demons can inhabit a Christian’s physical body (unbelievers can be possessed as well of course-probably more).Christians who dismiss this subject have probably never dealt with demonic possession themselves. However, that is not to say that they themselves do not have demons within their body. Initially, it is a very disturbing thought that one can have demons within them and not even know it. At one point, I began speaking with a Deliverance Minister because I was so tired of the constant demonic attacks against me. These attacks would continue on a daily basis and they would wear anybody out. I sought help because I did realize that I opened some very serious doors and that I was in over my head. A Deliverance Minister is a Christian who has a gift of casting demons out of people – although any true believer in Christ can do this if they know their authority. During our first conversation, she took some background information and the problems that I was dealing with. At this time, I was still not convinced that the demons were on the inside (possession) – I thought they were on the outside (oppression). I was still on the fence as to whether a true believer can have demons within their body. As she began casting out the demons, I suddenly felt a ‘flurry’ of activity in my abdominal region. There was so much movement that I mentioned to her what I had felt. Even at this point, I was not convinced that it was the demons. I told her that I thought it was the Holy Spirit moving within me. She immediately knew that this was not the Holy Spirit because of her prior spiritual warfare experience. The Deliverance Minister told me to get a Bible and put it on my abdominal area immediately. I rushed up the stairs to get a Bible and hold it over this area. This was all a part of the deliverance. The Deliverance Minister had brought to the surface the demons that were hiding within my body. I was absolutely shocked at the reality of this demonic possession. This wasn’t like in the movies. Demons can be far more subtle and they would prefer that you don’t even know they are there in the body. That way, they can cause sickness, mental illness, depression, suicidal thoughts, Obsessive Compulsive behaviour, etc. The only way to cast out demons is by a true believer in Jesus Christ. The only real way to know if one has demons within their body is to start commanding them to leave in Jesus’ name. A person who has not accepted Jesus as their Savior and Lord should never attempt to cast out demons – the Bible tells us that they will return in greater numbers. Only true believers in Jesus Christ have the authority to use the power of Jesus’ mighty name to cast out demons. This is very serious and I don’t recommend this to be tried without an experienced Deliverance Minister. There was some unexpected occurrence during one particular deliverance session (casting out demons takes persistence and typically many attempts). I’ve never publically mentioned something that happened directly in the midst of a typical session of her casting out the demons. The reason that I’ve never mentioned anything is because I’m so careful about not being a false witness that I’d rather not mention something than err. I still don’t know what to think about it, but I will explain what I saw. I guess this would be a vision because I was completely awake – or it could have been my imagination. Personally, I think it may have been a vision because it suddenly appeared. As she was speaking, suddenly I could see Jesus on the cross. I started to cry because I could see Him clearly in what I would describe as ‘widescreen’. I interrupted her and told her that I can see Jesus on the cross right now! I was almost hysterical because this scene just opened up and suddenly appeared without warning. I could only see Him from about the chest up. I couldn’t even see his hands. The best way I can describe it is like a close-up shot in a film. There He was hanging on the cross. The crown of thorns was not like how I had previously seen it in the movies. I recalled that in most movies that I had seen, the thorns were neatly around his head. In what I was viewing, the thorns were not neat at all. The thorns were also over the top of his head as well – not just around it. His hair appeared brown to me. His beard was also not like I had previously seen in the movies. It was a thick beard that was mostly brown with what appeared to be some black hairs as well (there were some darker spots). It was not a nice trimmed beard as I was accustomed to seeing. The reason His beard may have appeared so thick was because the Bible describes that the Roman soldiers literally ripped some of his beard out. His face was thin. Now the final part that I saw, I’ve also seen very similarly in a painting of Jesus. I saw Jesus staring up at the sky and his mouth was moving – although I couldn’t hear any words; I knew He was praying. This event occurred a couple of years ago now and I can’t remember how the session ended. I do know what I saw – but again, whether it was a real vision or an overly active imagination – I don’t know. I do know that I was looking at it for a period of time and it immediately brought me to tears. 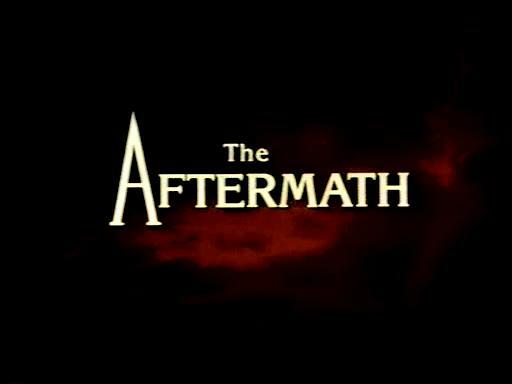 Since I received the Rapture message from God in early 2009, I’ve noticed that the media seems to have been pushing the satanic alien lie- it seems to be increasing and you can see this with the films described below. The most shocking movie that has come out since I received the message has been “Skyline” where it shows in the movie trailer – thousands of people being lifted up into “alien spacecraft.” My jaw dropped when a fellow brother in Christ sent me that one. I don’t know if these people making these films are doing this intentionally or unintentionally – but regardless there is definitely a demonic influence there and they are spreading the lie. The latest Indiana Jones movie had the satanic alien lie in it and so did “Super 8”. Just look for a moment how just one Hollywood Mogul is spreading this satanic alien lie from the pits of hell – this Director/Producer’s name is Steven Spielberg. With Spielberg alone, either producing or directing, look at some of these movies: Close Encounters of the Third Kind (1977), Et: The Extra-Terrestrial (1982), Batteries Not Included (1987), Men In Black (1997), Men In Black II (2002), Taken miniseries (2002), War of the Worlds (2005), Indiana Jones and the Kingdom of the Crystal Skull (2008), Super 8 (2011), Cowboys and Aliens (2011), Falling Skies (2011), and Men In Black III is in post production (2012). Steven Spielberg, whether knowingly or not, is a major player in preconditioning the masses to accept the satanic alien lie. There are demonic influences there for certain. I haven’t watched this garbage because the Lord showed me what is true. In a nutshell, here is the satanic lie they are spreading on television and their website: “Ancient alien theorists believe that thousands of years ago, extraterrestrials landed on Earth, where they were hailed as gods and helped shape human civilization. But what proof could possibly exist for such an encounter?” The History Channel also has a show called, “UFO Hunters.” I could go on and on listing off shows and movies that involve this satanic alien lie but I think I’ve made my point. These “alien” shows, as with examples like Spielberg’s films – are coming out more frequently to the masses. Finally, with numerous governments over the last few years disclosing various “UFO” files, we are starting to see legitimacy in the belief of “aliens”. Where it was considered ‘silly’ to discuss this subject years ago, now the ‘world’ seems to be quickly moving toward the assumption that there is indeed life elsewhere. Now the belief in life elsewhere besides earth seems to be taken for granted. It is certainly no wonder why many believe this with the constant bombardment of so-called “aliens” or “UFOs” in media – even the news, where they wouldn’t touch the subject years ago! Unfortunately it appears to be a trend where the topic of “aliens” is being legitimized for mass consumption.